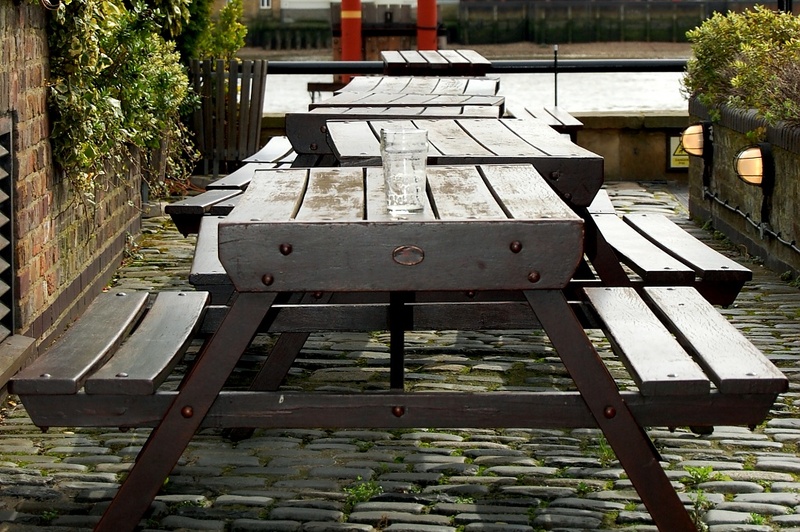 Just a empty pint to go with the empty benches at the Captain Kidd's beer garden in Wapping. There's something wrong with this scene.. It's the last working day of the week, it's lunchtime, it's a lovely little garden overlooking the Thames but it's empty...!!! Where is everybody?? Surely they can't all be shopping for Easter eggs?? Took this pic as I had a lunchtime wander, I didn't stop for a pint though... Drinking at lunchtime just makes me want to fall asleep at my desk these days. Sorry you were left alone...and in such a nice place! Ahhh...all those people would have just mucked up the serenity of the scene! Happy Easter Holiday! Four days off of work? Wow! We don't even get Good Friday off around these parts! Well, have fun and enjoy! Happy Easter! I like the meandering lines and perspective of the tables. nice one. i really like the perspective in this.